Old 500 manat banknote of the first manat. The manat is the currency of Turkmenistan. It was introduced on 1 November 1993, replacing the Russian ruble at a rate of 1 manat = 500 rubles. [not in citation given] The ISO 4217 code was TMM, and the manat was subdivided into 100 tenge. The abbreviation m is sometimes used, e.g., 25 000 m is twenty-five thousand manat. On January 1, 2009, the new manat was introduced with ISO 4217 code TMT at the rate of 5000 old manat to 1 new manat. The word "manat" is borrowed from Persian word "munāt" and the Russian word "монета" ("moneta") meaning "coin". Likewise, 'manat' was the name of the Soviet ruble in both Azeri and Turkmen. In 1993, coins were introduced in denominations of 1, 5, 10, 20 and 50 tenge. The 1, 5 and 10 tenge were struck in copper-plated-steel, with the higher denominations in nickel-plated-steel. This first series of coins was short lived as their metal value soon became worth more than their actual face value. After a period of high inflation, new coins of 500 and 1,000 manat were introduced in 1999. All coins of this period had to depict a picture of the president by law. During the monetary reform of 2009, new coins of 1, 2, 5, 10, 20 and 50 tenge were issued with bimetallic 1 and 2 manats following in 2010. The 1, 2, and 5 tenge are nickel-plated steel while the 10, 20, and 50 tenge are made of brass. Instead of depicting the current head of state the coins feature a map of Turkmenistan with the Independence Tower superimposed in front of it. All circulating coins of Turkmenistan have been minted by the Royal Mint. In 1993, manat notes were introduced in denominations of 1-, 5-, 10-, 20-, 50-, 100 and 500 manat, replacing the Soviet ruble. These were followed by notes for 1,000 manat in 1995 and 5,000 and 10,000 manat in 1996. In 2005, a new series of notes was introduced in denominations of 50-, 100-, 500-, 1,000-, 5,000 and 10,000 manat. All notes, with exception to only the 1 and 5 manat banknotes bear a portrait of former president Saparmurat Niyazov. All Turkmen banknotes are produced by the De La Rue printing and banknote company. In 2005, a new series of manat banknotes was introduced. They had originally been intended to replace the first manat at a fixed rate, with 1000 equal to 1 of the first manat, but the revaluation was postponed and this issue was released to circulate with previous manat issues. The series of notes was introduced in denominations of 50-, 100-, 500-, 1,000-, 5,000 and 10,000 manat. Two new coins were also introduced in only two denominations, 500 and 1,000 manat. Both the first and second issue manat banknotes circulated in tandem until the issue of the Second Manat (revalued) issue in 2009. After hyperinflation significantly devalued the currency, a new manat with a fixed exchange rate was introduced, replacing the old manat on a ratio of 5000 OM = 1 NM. Banknotes in this series were printed in denominations of 1-, 5-, 10-, 20-, 50-, 100, and 500 new manat. As part of an effort by the Turkmen government to dismantle the Niyazov cult of personality and help politically disambiguate the current rule, only the highest valued banknote, 500 manat, bears a portrait of the former leader. 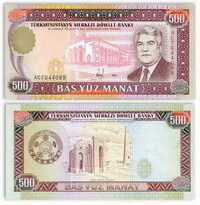 The 500 manat notes have not yet been released into circulation. The other denominations feature images of buildings in Ashgabat or technological achievements (TurkmenSat 1) and portraits of Ahmed Sanjar, Oghuz Khan, Magtymguly Pyragy and other figures in Turkmen history. Images of the third manat. The currency is not fully convertible due to exchange rate limits set by the government, so a black market for exchange rate exists. It was at 18 TMT per U.S. dollar as of 9 October 2018[update]. ^ "Definition of Manat". Dictionary by Merriam-Webster. Retrieved 19 March 2018. This page was last edited on 24 March 2019, at 12:58 (UTC).